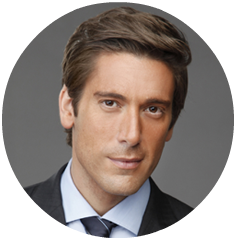 David Muir is an Emmy-award winning journalist for ABC News. 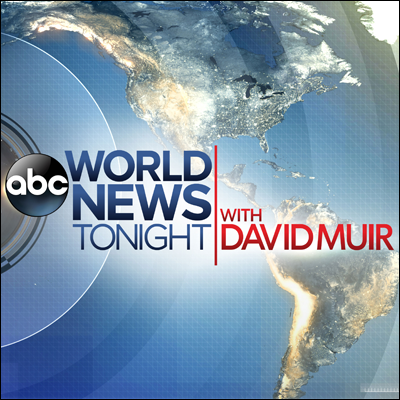 Muir is the anchor and managing editor of ABC World News Tonight with David Muir and co-anchor of ABC’s 20/20. For more than a decade, Muir has reported from international hotspots around the world including Tehran, Tahrir Square, Mogadishu, Gaza, and Fukushima. Muir’s exclusive interviews generate global headlines. Most recently, Muir landed the first interview with President Donald Trump after his inauguration. Muir also secured the exclusive interview with President Barack Obama during the former President’s historic trip to Cuba; the exclusive interview with Apple CEO Tim Cook amid the battle between Apple and the FBI over whether to unlock the San Bernardino killer’s iPhone; and the exclusive sit-down with Pope Francis inside the Vatican. Muir moderated a historic town hall, Pope Francis and the People, spending more than an hour with the Pope in a television first. During the 2016 campaign, Muir moderated Democratic and Republican Presidential primary debates and conducted numerous interviews with presidential candidates including former Secretary of State Hillary Clinton. It was during Muir’s interview with Secretary Clinton she apologized to the American people for her use of a private e-mail server.